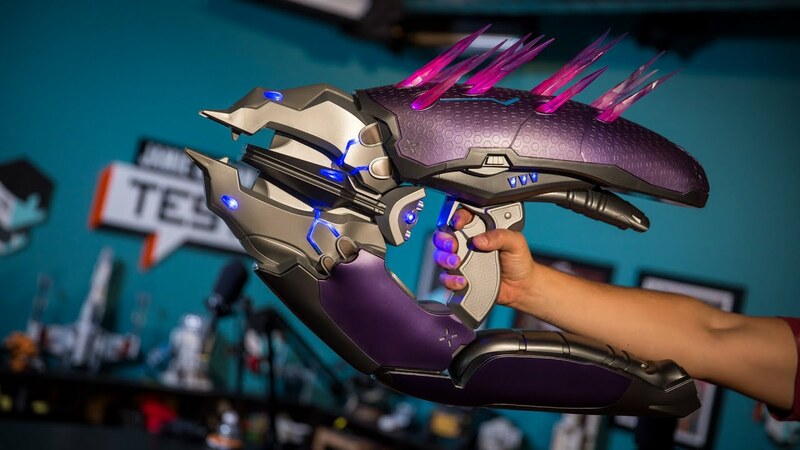 To tie in with Halo 4, NECA have cranked out a replica of the Needler weapon from the games. Unfortunately, even at a bargain price from Germany, it cost about as much as something that awesome should. It should be here for my Birthday and the shipping was free. Provided that it all works, the only thing that would make it better was if it actually fired pink homing spikes out of it. I think it'll look good alongside my two golden Lancers from Gears of War . I must be having a tiny bit of bad luck with this. I got the gun thru eBay weeks ago but it wouldn't make a sound or animate when you tried to fire it. It didn't seem to be assembled quite properly either. Bits didn't fit the way they should've. eBay were excellent about the return but the seller in Germany was kinda hopeless. First he tried to do nothing about it. Then he would only provide a refund, provided that I destroyed the gun and sent a photograph of the result. *Needlers* to say... I didn't destroy anything and eBay sent me a full refund. So that was carton #441. I then ordered another one from Amazon, which was £40 more expensive. Along comes carton #440. So, in theory I now have two sequential items off the production line and this one, while it looks to have been assembled fine, doesn't work either for the same reason. I hope it's a faulty batch and that the third one which should be soon arriving might be from a different point in the production run. Perhaps it might even work. So, the third Needler arrived from Amazon in record time. This one is carton #367 and it works! I had to press the spikes a bit and press the reload button before the spikes would move but it works perfectly and it looks exactly right. Amazon wants the original one back within 30 days. One of the possible drop-off points is the petrol station next to our house. I'm gonna let them have the eBay one, which looks not-quite-right. It'll serve the same purpose to them. At least their useful for that. Their petrol prices are crazy. You might as well buy a yacht in the Bahamas with the money you'd need to run a Subaru on their petrol.